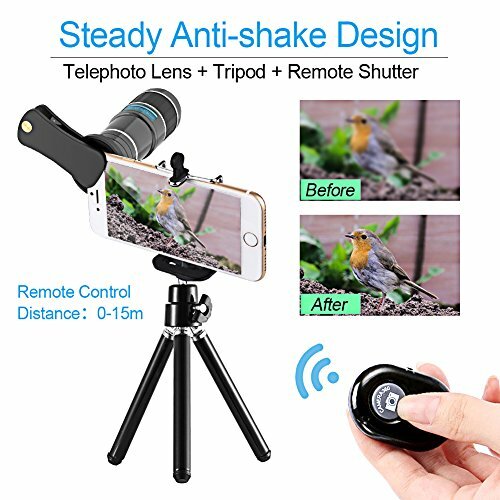 With 12x telephoto lens attached to the phone, it does a great job at optically magnifying the image by 12x but the target will stay clear enough if you focus on it correctly. — 0.65x wide angle lens completes a picture when shooting with big group of people. NOTE: Two lenses are screwed together upon receipt. The 180° fisheye lens has to be a favorite as it has a neat effect showing round, fish bowl effect. 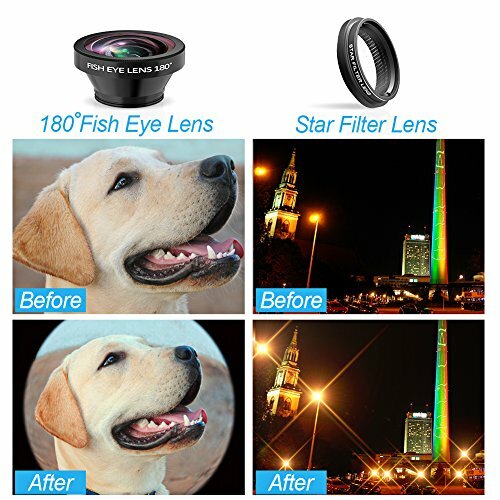 The star filter lens lines radiate outward from bright objects to show better sparkling function of light source. — It shows the picture better color restoration and saturation. Besides, it limits the distortion below 8% for more satisfied shooting experience. 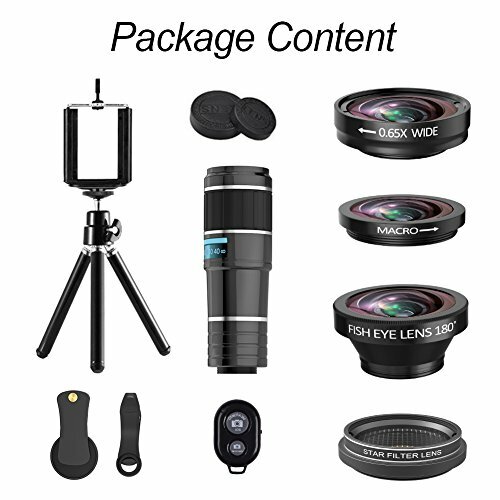 — An ideal lens kit to offer you more fun while shooting! — Please readjust the clip position if there is vignetting appears when taking picture. 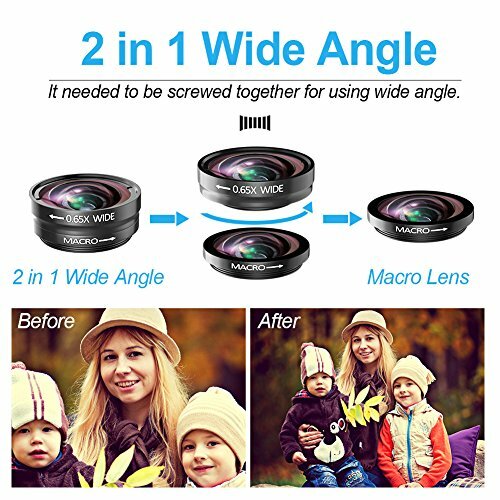 2 IN 1 WIDE ANGLE & MACRO LENSES: This two lenses were attached together upon receipt due to easy storage. 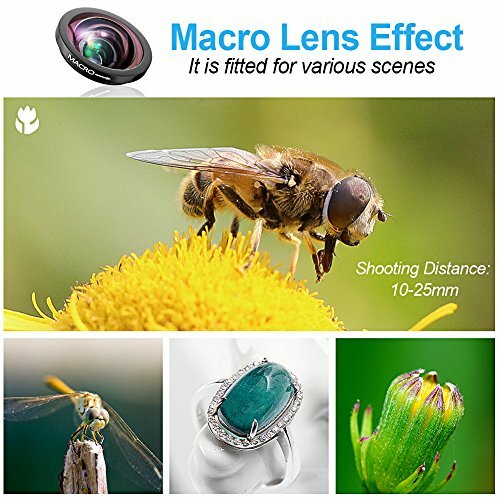 Kindly attach the lenses without twisting off the macro lens when enjoying wide angle lens. For trying macro lens, please kindly detach the wide angle lens through the arrow direction shown on the side. 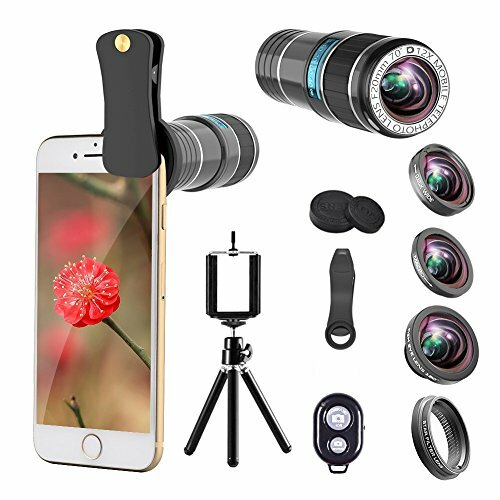 ☞ Gently screw the lens to avoid stuck in the clip. 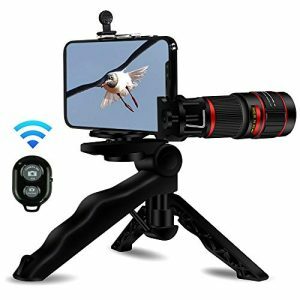 WIDE RANGE OF COMPATIBILITY: The telephoto lens kit comes with two clips inside, which allow the lens to work with many of different mobile devices like iPhone, Samsung, Sony, huawei, ipad tablets and many others. 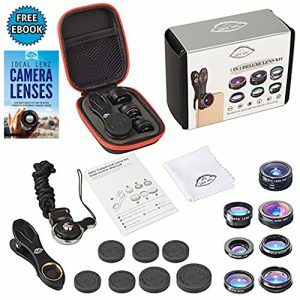 The lens kit is used for outdoor sports, filming scenery, watching the nest, concerts or any physical activity, etc.. ☞ Normally Big clip for telephoto lens and small clip for other three small lenses. ◎50MM Big Object Lens: The big Object lens With an Object lens Diameter 50mm, is coated by HD optical green film enable you to see the object more clearly and broader view angle through the Telescope lens.Especially when you watching far away object like moon or Mountain.Big Object Lens give you better experience. 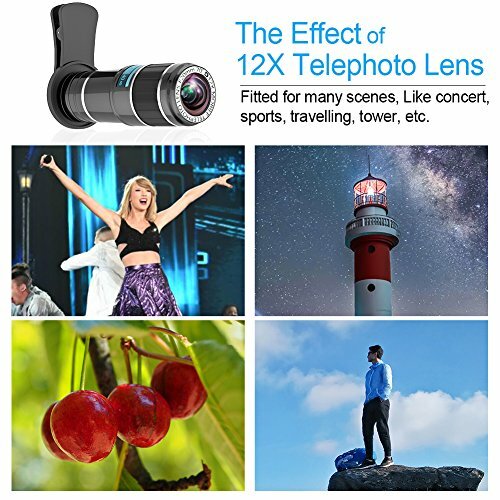 ◎12X50 HD Magnification:Full 12X magnification and 50mm object lens Portable Telescope to get the best view for adults and Kids indoor or outdoor. Long and Broad View (150M/1000M) for Bird Watching, Fishing, Wildlife Watching,Hunting, Climbing, and Sightseeing. 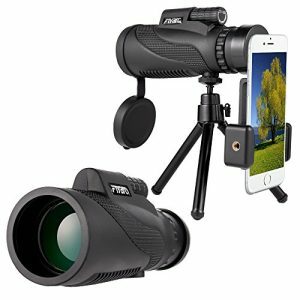 ◎ Waterproof Heavy Duty Design :Waterproof, dust-proof and shockproof design, protect Your Telescope form any weather or Environment. 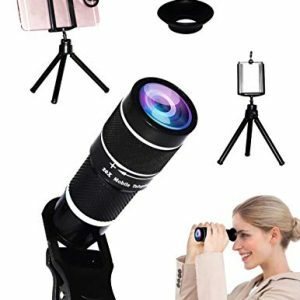 The telephoto lens Framework is made of Engineer Grade Plastic Rubber,Strong and Light Weight. The Hand stripes makes Phone Telescope Easy to Carry along with you,never Dropping Off from your hand. 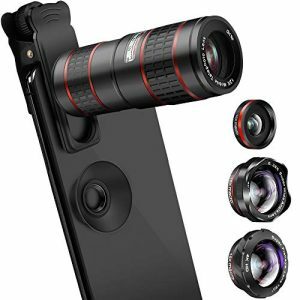  3 in 1 LENS KIT – Including an 18x zoom Telephoto Lens, a 0.45X Super Wide Angle Lens and a Macro Lens. 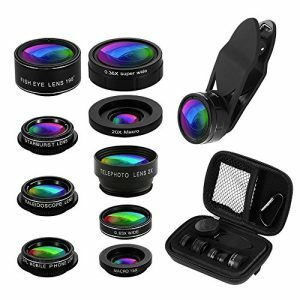 All lenses are crafted with optical glass and full multi-coated for enhancing light transmittance.  SIMPLIFIED INSTRUCTION – Fix the clip on the phone camera. Insert the fixed ring on the telephoto lens and screw the lens on the clip. Connect the tripod and lens. Then you could take a photo. 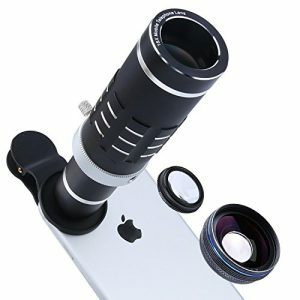 We also have a customized phone case for the telephoto lens.